The Oleander Hawkmoth, Daphnis nerii, is a member of the Sphingidae family of moths and one of the most beautiful Hawkmoths in the world. It has a wingspan of 90-110 mm and like many Hawkmoths is a strong flier. Its beauty has made it one of the most sought after species amongst many lepidopterists, breeders and those interested in insect photography. In the warmest areas of its range it has several, overlapping generations. However, in the northern parts of Europe, where small numbers of migrants are recorded annually, it’s unable to survive the colder winters at any stage of its life cycle. 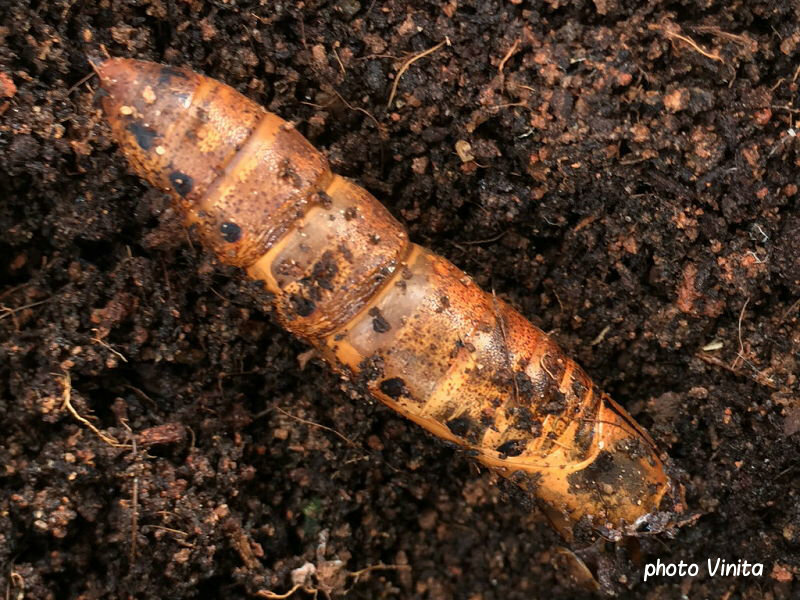 Other Hawkmoth caterpillars and moths can be seen in the Hawkmoth galleries and species pages. The Oleander caterpillars grow to 130 mm in length and are very variable in colour. The pattern of the white freckling in sub dorsal and dorsal areas is quite distinctive. The startling blue false eyes are most clearly seen when a fully grown caterpillar is threatened. By retracting its head and arching up the swollen anterior body sections the eyes appear startlingly large, giving the impression of a much larger animal. 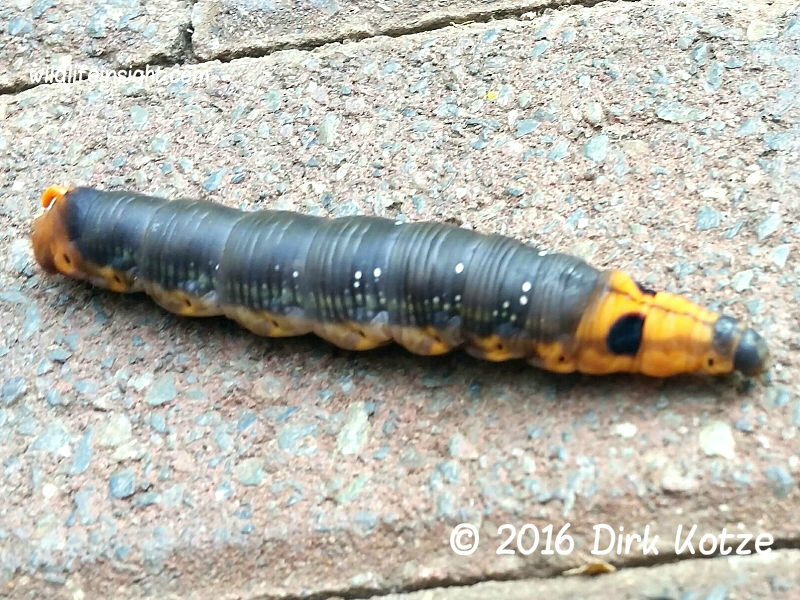 Fully grown larvae have quite short, yellowy orange, down turned tail horns. The upper half of prepupating caterpillars such as the one featured left sighted by Hazel Davies in the Krugger National Park, South Africa, is generally much darker against which the white freckling stands out. Other migrant Hawkmoths to the UK from Africa and southern Europe include the The Death’s Head Hawkmoth’s caterpillar, The Convolvulous Hawkmoth, The Striped Hawkmoth and The Hummingbird Hawkmoth. 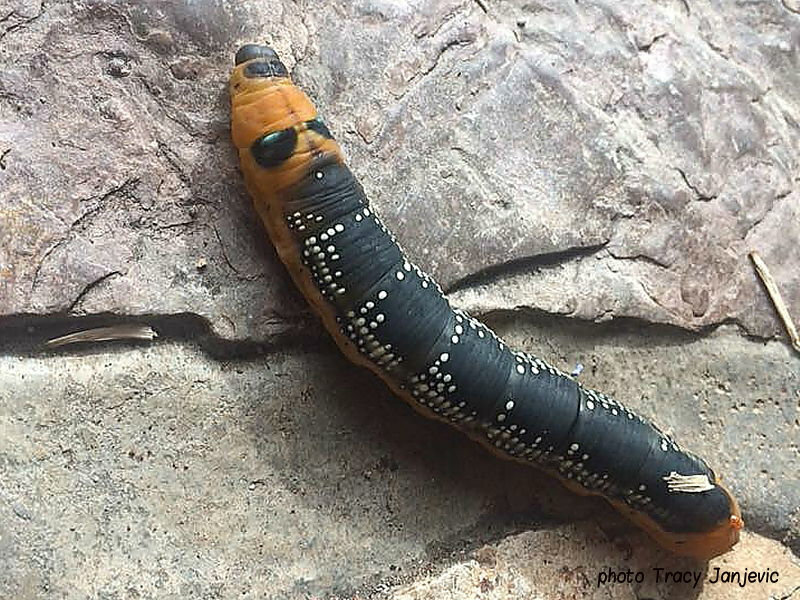 The photographs featured of Oleander Hawkmoth caterpillars were received from Yuh Tian, Keith Richards, Dirk Kotze, Tracy Janjevic, Matt Worthington, Sue Brough and Vinita. Sightings of Oleander Hawkmoths and their caterpillars have been received from Portugal, Spain, Italy, Cyprus, Montenegro, South Africa, Zambia, Egypt, Malaya, Singapore, India and Thailand. Sightings and identification requests are very welcome and images may be added to the site with accreditation. Copyright remains with the photographer. Other caterpillars can be seen in the British caterpillar gallery. The Oleander Hawkmoths pupate amongst dry leaf litter and soil. In warm temperatures the moth emerges within 30 days. 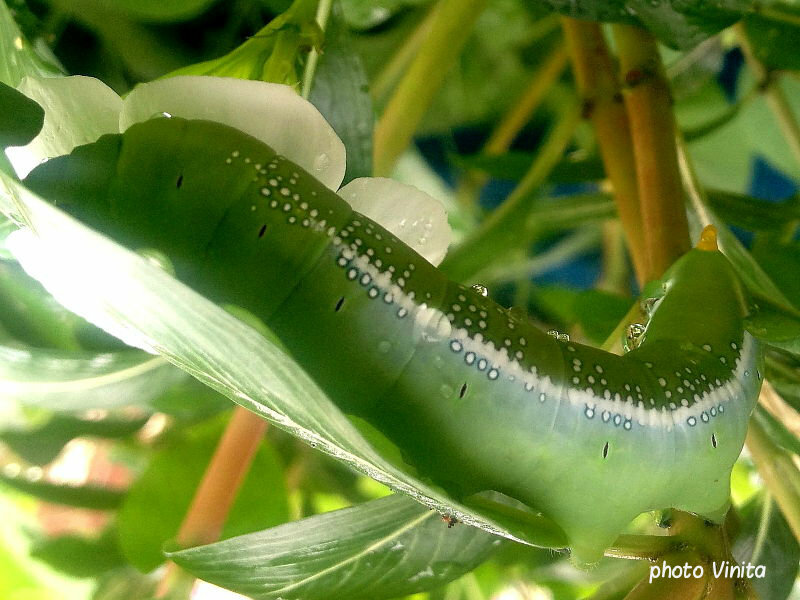 Vinita in Bangalore, India found several Oleander Hawkmoth caterpillars feeding in her garden on vinca rosea, a species closely related to Madagascan periwinkle. One caterpillar was successfully reared through with the moth emerging in 18 days. Other Indian Oleander Hawkmoth caterpillars shown below were reported by Abhiroop Singh in the Punjab and Arindham Mukhopadhyay in West Bengal. 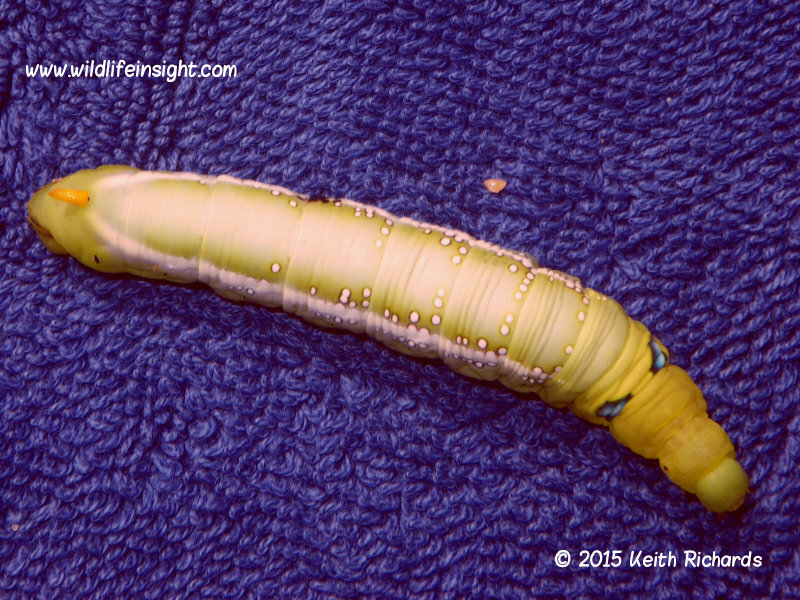 Hawkmoths of the Western Palearctic – Pittaway. The Colour Identification Guide to Caterpillars of the British Isles – Jim Porter. Field Guide to the Moths of Great Britain and Ireland – Waring, Townsend and Lewington. Moths of the British Isles – Bernard Skinnner.